Crime fiction fans, this month is your month, because we’re going to indroduce you a crime writer, an Aussie, Barry Maitland. The author is coming to Parramatta Library on 27 August, and he will talk about his latest title Raven’s eye, from 1 to 2pm. Barry Maitland was born in Scotland and brought up in London. After studying architecture at Cambridge, he practised and taught in the UK before moving to Australia where he was Professor of Architecture at the University of Newcastle. He has since retired from the university to pursue his writing. Maitland’s first mystery The Marx Sisters was a nominee for the John Creasey award for Best First Novel and The Malcontenta won the Ned Kelly Award for Best Crime Fiction. Bright Air, Maitland’s first crime novel set in Australia was published in 2008. The Raven’s Eye is his twelfth Brock and Kolla mystery. In this recent book, Maitland contines his Brock and Kolla’s series, but it’s one of their bloodiest investigations. On the trail of a brutal killer with a meat cleaver and a grudge they’re also watching their backs as new technologies threaten their jobs. A throat-stopping, heart-thumping mystery from one of Australia’s most acclaimed crime writers. A woman dies in her sleep in a houseboat on the Thames; the apparent cause of death, an unflued gas heater. It all seems straightforward, but DI Kathy Kolla isn’t convinced. Both Kathy and DCI Brock run up against opposition in their investigation. An aggressive new Commander seems to have a different agenda, focusing on the new realities of economic constraints, and favouring emerging technologies over the traditional policing methods. Old-fashioned coppers like Brock and Kolla are being squeezed out. To make matters worse, there’s a new Task Force moving in on their patch, and a brutal killer, Butcher Jack Bragg, to be tracked down and caught. It’s one of Brock and Kolla’s bloodiest investigations yet. A heart-thumping read, The Raven’s Eye gives us Brock and Kolla under pressure; it’s a clash between the menacing ever-present eye of computer surveillance versus the explosive threat of a man with a meat cleaver and a grudge. The book Raven’s eye will arrive to our library shortly once it’s released on the market. Parramatta City Library has other of Maitlan’s titles for loan. 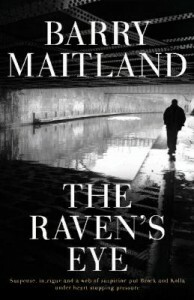 This entry was posted in Australian Authors, Fiction, Mystery & Crime, Recommended Reading and tagged Author, Author Talk, Barry Maitland, Parramatta City Library, Raven's eye, Writer by admin. Bookmark the permalink.